Paper Sculpture Pie and Happy Thanksgiving! 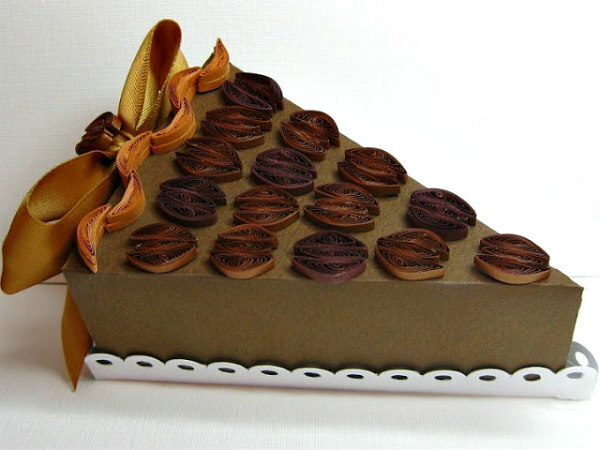 Feast your eyes on this paper pie slice with quilled pecans made by Sonya Appel for the Custom Quilling newsletter that doubles as a party favor box. Not nearly as many calories as the real thing, but definitely just as wonderful! Sonya is a dynamo in the quilling and stamping worlds, always coming up with inspiring ideas. Check out her blog for more information about how she went about making the pie slice. My mother, who has had Alzheimer's for quite a few years, grew up in southern Virginia where pecans reign supreme - seriously, pecan pie is on the menu of nearly every restaurant. Last autumn Mom was still able to go to the grocery store with my dad, despite not having a clear idea of who or where she was. On one shopping trip she spied the display of pecans and insisted they buy a bag for my sister and me. Old habits die hard you know... the purchase of pecans had always been an annual tradition that launched the holiday baking season, and for some reason it stayed in her mind even though so many other things had vanished. I'm thankful she's still with us this year and able to enjoy a slice of pie. To those of you here in the U.S., Happy Thanksgiving! I'll be back on Monday, gearing up for the holidays. 'Tis the season! That slice of pie is awesome! I should get it for my dad. Pecan pie is his all-time favorite, but many years ago he ticked off my mom (I can't remember how or why) and she hasn't made him another one since! This time of year he always goes snooping around, trying to get someone to make one for him. Ha! Sorry to hear about your mom. My grandpa had Alzheimers, so I know how hard it is to see a loved one go through that. Beautiful Pecan pie! Looks so much like the real one. Have a wonderful time together. I saw you on HGTV this morning!!!! I still love that ornament!! I was born and still live in Virginia and remember so well seeing all those signs about pecans every time we drove south. I absolutely love pecan pie and that box is totally adorable. How sweet that the pecans are one memory that your mother held on to. 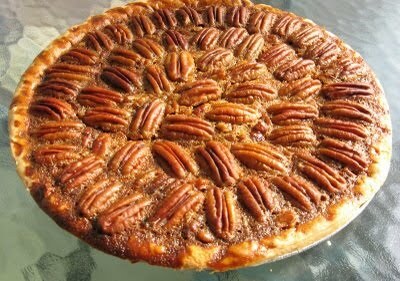 As a Southerner abroad, I can tell you I miss my pecan pie, especially today of all days (we don't see pecans often in France and certainly not in pies - of course we don't have the pies either). It was a pleasure seeing these two examples. Both are lovely, although one can enjoy the paper one without the calories. Melissa, that's too funny about your mom, dad, and the pie incident. Marilyn, I didn't know the show was going to be on again - how nice to hear that! Maureen, yes, tons of signs! Stuckey's right? I always thought that was the funniest name for a store. Collage Cottage, no pecans, but I hear macarons are mighty fine! hi ann! i hope you're having a good thanksgiving weekend. the slice of pie box is very cute. i should stop being surprised at the creativity of others, but yup, it gets me every time. very cool. and such a touching story about your mom. thank you for sharing. I love your quilling, and have been a follower of your blog for quite some time. In fact, I think it was your blog that got me started in quilling in the first place! Do drop by when you're free and tell me what you think? I'd love to learn from an experienced quiller like you! This is the best paper pie slice I have seen! Wonderful! The quilling is fantastic - I will go to visit Sonya's blog! Wishing you a fun day tomorrow!